Your curious feline is a natural predator. You have a long day at work, stumble up your front steps and look down at the welcome mat. There it is: a dead rat. 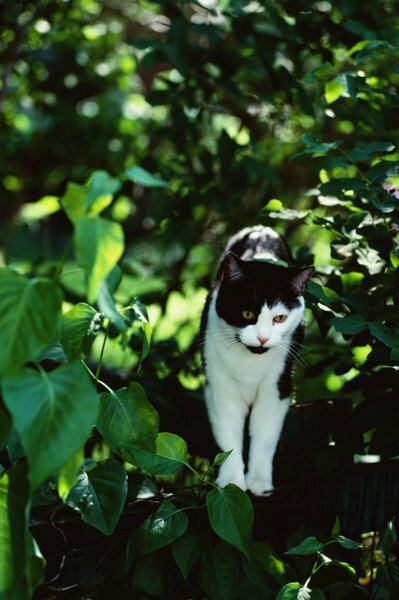 Whether you allow your purring pal to prance around outside or give him access to your unfinished basement, he'll probably catch a rodent here and there. Once in a while rats, squirrels and other pests can have rabies. Even if little Fluffy doesn't eat the rodent, he is at risk of catching the disease if the infected critter bites your lovable pal. So if your fuzzy family member eats a rat, squirrel or other small animal, watch for warning signs of the disease. Rabies affects the central nervous system, causing mammals that become infected to act agitated, fearful and abnormal. Your little buddy may stumble around, try to bite you and drool uncontrollably if he is infected. Little Fluffy can transmit rabies to you or a family member, but human fatalities are rare. As of 2012, there were only 28 human deaths from rabies in the preceding 10-year span, reports the Humane Society of the United States. Your playful kitty can contract fleas from other mammals, including rats and squirrels. Fleas on your fuzzy friend's skin are not only annoying to him, they can be dangerous. If Scruffy ingests a flea while bathing, he may wind up with tapeworm, since fleas are often carriers. These pests wreak havoc on Scruffy's small intestinal tract. While fleas don't typically bother humans, if one cat in your household has fleas, he will probably transfer the bugs to other animals. Don't stress. It takes a little work, but fleas are easy to get rid of. Take your flea-covered buddy to the vet for a flea bath. While he's at the vet, wash all pet bedding, as well as your own bedding, with hot water. Vacuum every room in the house and, if the infestation is severe, you might want to use a flea-eliminating fogger to kill any bugs you missed. Tiny bones from rats and squirrels present a choking hazard for your cuddly feline. He is probably excited from his recent catch and may gulp down large pieces of flesh. Bone fragments can get stuck in his airway, making it difficult for him to breathe, and he might panic. Even if your kitty is acting erratically and stressed after feasting on a rodent, it might not be a choking emergency. Blockages in his mouth can make him panic. Pry his mouth open, look for bones stuck in his teeth, on the roof of his mouth or in his throat. You may be able to pull it out on your own if you can see it. However, if you suspect choking or cannot free the bone from your best buddy's mouth, rush him to the vet. While it probably sounds odd, cats who eat infected rodents can catch the plague. Yersinia pestis bacteria come from fleas found on rats, squirrels and many other small wild rodents. If your furry pal gets bitten or consumes a sick animal, he'll probably get infected with the bacteria. In rare cases, your pet can transmit the plague bacteria to you if he bites you or if you come into contact with his blood. Early warning signs include pain and swelling in the lymph nodes, fatigue and very high fever, according to a report on KTVZ.com. The plague is often treatable with antibiotics for animals and humans, but in severe cases, pets and infected animals have to be put down. What Does It Mean if a Cat Sleeps on Your Stomach? Do Cats Likes to Eat Mice?